A famous African proverb says, “until the lion learns how to write, every story will glorify the hunter”. This statement is no truer than it is of our understanding of the size of the African continent. For centuries, the world has been made to believe that Africa is much smaller than it actually is. Why? Because the Westerners who created the world map we now use enlarged their countries, and Africans have yet to create or champion their own. Google Maps Underselling Size, Scope Of Africa? What’s wrong with our existing world map? More and more people are finding out that the traditional map they saw in school and today’s digital on sites like Google and Bing, are largely misleading. For example, Canada looks exceptionally large on the world map. 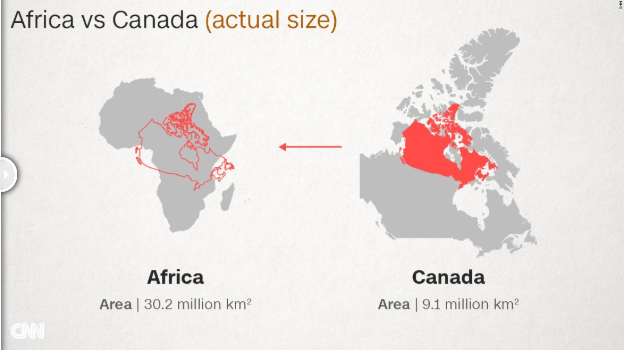 But although the country is expansive, sitting between two oceans, in six time zones, and dominates most of the northern half of the globe, “three Canadas would comfortably fit inside Africa”, CNN reports. The European cartographer Geert de Kremer, better known as Mercator, who created the world map in the 16th century did his projection on globes for sailors. “The 1569 Mercator projection was made for navigating the seas — drawing the meridians and parallels as straight lines that cross at right angles helped sailors to navigate some of their first treacherous voyages around the world”, CNN explains. Taking the globe and trying to impose it on a sheet of paper is what ultimately led to the distortion we have now. 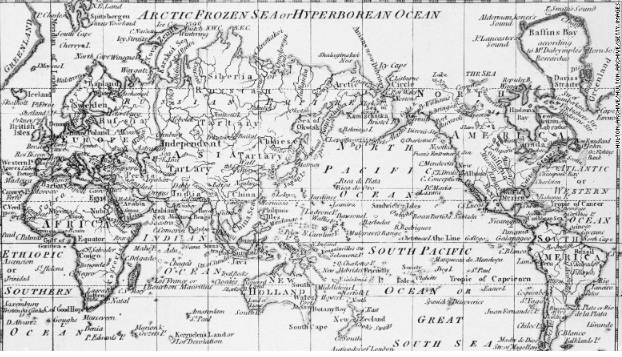 Mercator took the equator as the logical center of the map and this left big confusing gaps near the poles on the map. 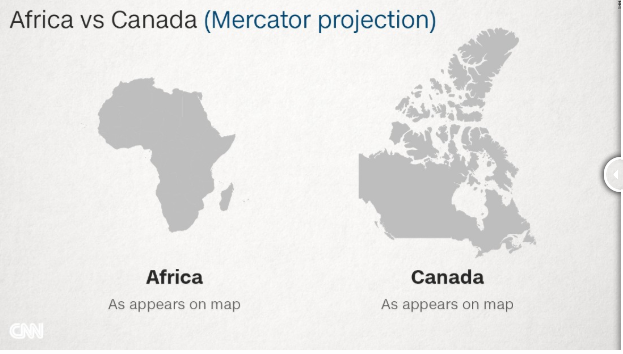 “On the Mercator map, Africa — sitting on the equator, reasonably undistorted — is left looking much smaller than it really is. But Canada, Russia, the United States and Europe are greatly enlarged. The distortion is largest near the poles: Greenland, which looks about the same size as the whole of Africa on the Mercator, is a classic example. In truth, it is no bigger than the Democratic Republic of Congo,” CNN continues. 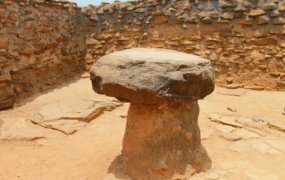 But the error in cartography has persisted and continues to create and reinforce a false global hierarchy that continues to belittle and downsize Africa in its geographical, political and social significance. “That European and North American countries are enlarged is no accident. This system provided more space for Western cartographers to mark towns, cities, roads etc in their part of the world. There was, of course, much to map in Africa, too, but that mattered less to the cartographers up north,” Menno-Jan Kraak, president of the International Cartographic Association and professor of cartography at the University of Twente, Netherlands explains. “The world maps that prevail today have been embedded in Western imaginations since the British empire. They continue (to prevail) despite many challenges to their fairness and accuracy because they underpin the ongoing Anglo-Euro-American presumption that the world belongs to them, and pivots around these geo-cultural axes,” Marianne Franklin, professor of Global Media and Politics at Goldsmiths, University of London, adds. So what’s the actual size of the continent? Fortunately, a number of historians are adamant about bringing a more fair depiction of the continent to the world. Although no map can be perfect, as there is no way to accurately depict a spherical object in 2D, there are maps that help put things into perspective. The Peters projection from the 1970s (also called Gall-Peters projection) is one such model. It is currently being used “to teach children the real size of the continents” in classrooms in Boston. But in order to show the actual size of land masses, the Peters projection distorts the shapes of the continents. Another alternative is the Winkel Tripel projection, which has a smaller skew and was introduced in the US and Germany in the 1920s. These two maps and the initiative of the Boston school district to integrate the Peters projection into its curricula is a great first step. Greater adoption of these maps in schools and in the digital space across the world will do a lot of good in representing Africa in its true magnitude – geographically, politically, economically, and other wise. Moreover, as the proverb on the lion and hunter suggests, Africans must be the first to share and champion this cause.